SPRING GROVE, PENN (Aug. 26, 2016) – The book, Return to Order, has just won its tenth award, a milestone that underscores the author’s message is resonating with an America that needs to find its moral compass. 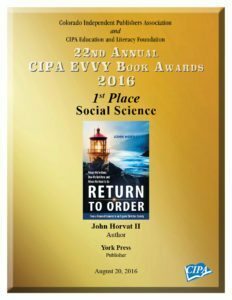 The book, written by John Horvat II, vice president for The American Society for the Defense of Tradition, Family and Property (TFP), earned First Place prize in the 2016 CIPA EVVY Book Awards in the Social Science category. 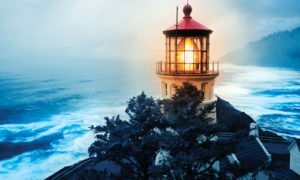 Return to Order: From a Frenzied Economy to an Organic Christian Society —Where We’ve Been, How We Got Here, and Where We Need to Go is reaching readers and driving discussions nationwide as Horvat speaks to groups, talk show hosts and leaders. He has been inspiring listeners with his candid and motivating messages making the necessary links between the economy, faith and moral values. He demonstrates that society’s secular, materialistic culture is causing social and economic ruin. The CIPA EVVYCC Book Award is significant because it is one of the oldest independent publishing competitions in the country. It is sponsored by the Colorado Independent Publishers Association (CIPA), along with the CIPA Education and Literacy Foundation (ELF). It attracts writers in 39 categories from all over the world. The award comes as nearly 240,000 copies of Return to Order are in circulation in print, e-book and audio formats. Horvat has given presentations in more than five dozen cities across the nation and in Europe and has participated in more than 350 media interviews in the past three years. He is also a frequent contributor to numerous national news outlets including American Thinker, Crisis Magazine, Imaginative Conservative, TheBlaze and others. Return to Order has received dozens of endorsements from church, military and political leaders. It has ranked #1 on Amazon/Kindle in four countries. “This book proposes a revitalization of long-standing Christian practices as an antidote to current economic discontinuities. Using practical-minded recommendations to resolve massively complex societal issues, Return to Order is a proposal that should be welcomed by those looking for a path to economic recovery and a tempering of future disruptions,” says Chicago Daily Observer President John B. Powers. For more information about Return to Order, to receive an electronic media kit, or to schedule an interview with John Horvat, please call 717-309-7147 or email jh1908@aol.com. This entry was posted in Return to Order and tagged America, award, CIPA EVVYCC Book Award, John Horvat II, Organic society, Return to Order, society, Tenth award by Returntoorder.org. Bookmark the permalink.